In conjunction with our friends at Recent Toys, we're delighted to be giving away a pair of Whistle Racers (RRP £11.98) to eight lucky winners in an exclusive competition launching soon. Join our newsletter to be informed of this competition's launch! Whistle Racers... the harder you blow, the faster and further they go! 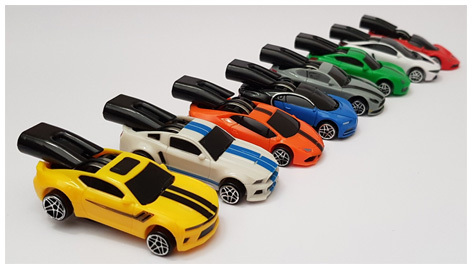 With no batteries required, these interactive toy cars provide hours of racing fun - and the fact that they are propelled by blowing means they even help to increase kids' blood circulation at the same time. A patented steel flywheel gives the car both the motion and the unique whistle sound. There are eight different cars in the series to collect, all available with and without the racing launcher. Recent Toys UK is an exclusive partner of Whistle Racer International. Please tell us what you think of the Whistle Racers.